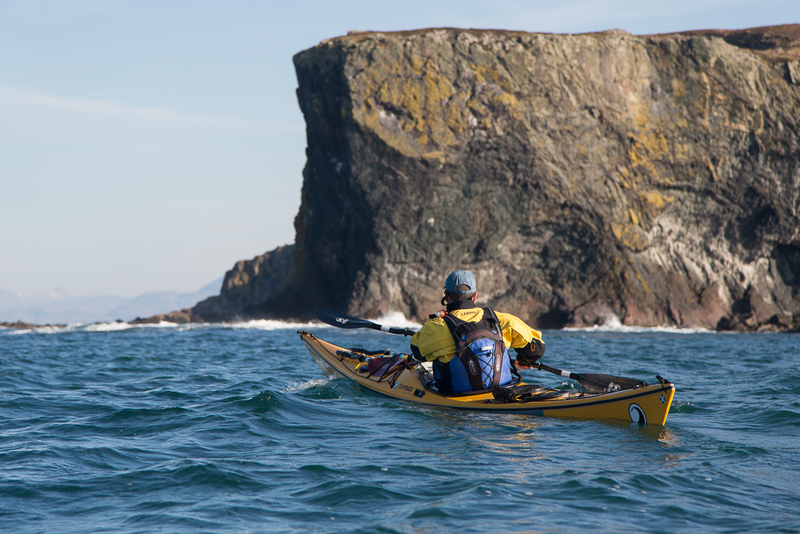 Sea kayaking desktop wallpaper calendar 2014. I wish a very Happy New Year and a great 2014 paddling season to all visitors to seakayakphoto.com. As way of a celebration of the last year and in anticipation of sea kayaking adventures yet to come, here is the 10th annual sea kayaking desktop wallpaper calendar from seakayakphoto.com. I apologise for its late arrival. Neither my computer nor myself have been in the best of health. As in past calendars, all the photos were taken during the previous year (2013). 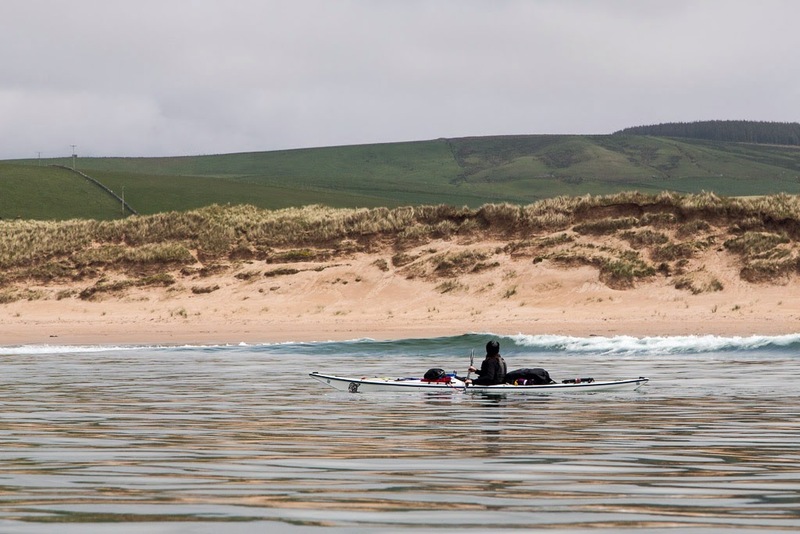 Unfortunately I have not been paddling over the last 6 months so the choice of photos has been more limited than previous years. Nevertheless I have been able to choose photos from north and south of Ardnamurchan Point, the Inner Hebrides, the North Channel, the Firth of Clyde and the Solway Firth. The Little Cumbrae lighthouse in the Firth of Clyde proved surprisingly popular despite being in the depths of winter. We met friends from the Drumchapel and Clydebank Kayak Club there. Link to 8:5 desktop 1920 x 1200. Link to 4:3 desktop 2048 x 1540. Rubha Carrach is on the exposed northern coast of Ardnamurchan. This coast is not paddled as often as it should be. 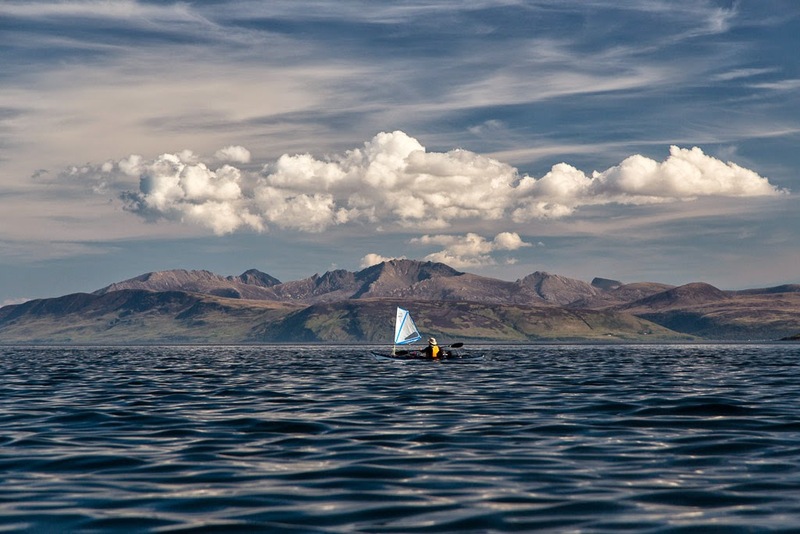 Most circumnavigators of the British mainland cross to Eigg or Rubh' Arisaig on their headlong dash north. Paddlers staying in the area are faced with a circumnavigation of the whole Ardnamurchan peninsula if they only have one car, or a very long shuttle (over very slow single track) if they have two cars. Glenuig Bay opens into the Sound of Arisaig and views extend along the Ardnamurchan peninsula and to Muck and the other Small Isles. 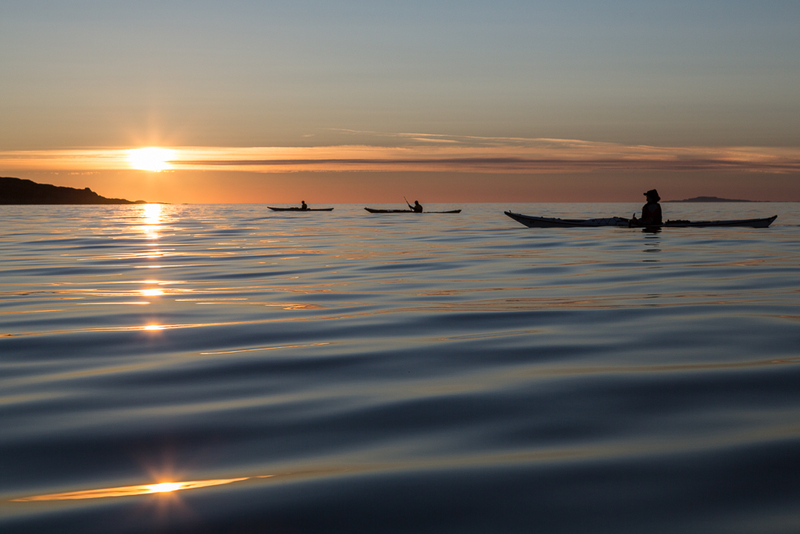 One of the great joys of winter paddling is returning in the dark! The north coast of Rum in the Sea of the Hebrides is a wild place. This is the sad wreck of the Jack Abry II, a French trawler that ran on to the rocks here just before midnight on the 31st January 2011. Fortunately, despite a gale and the surrounding cliffs and mountains, all 14 men on board were airlifted to safety by the Stornoway coastguard helicopter. 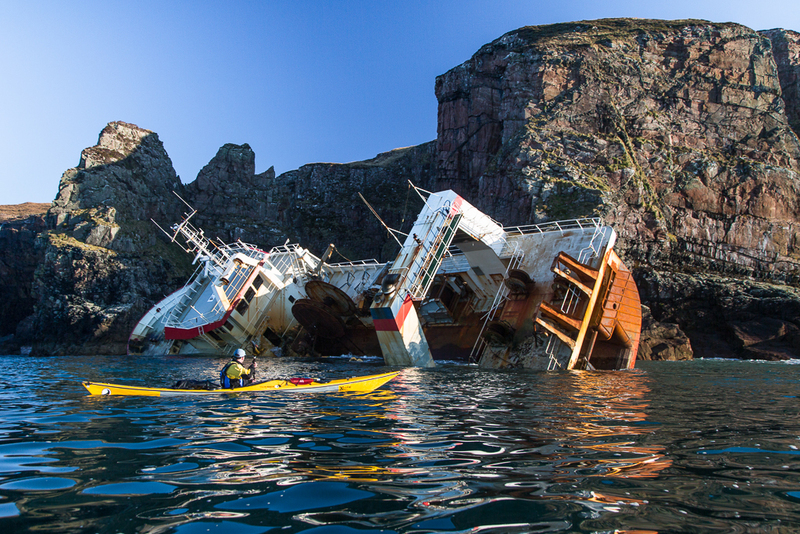 The Mull of Kintyre is a rather committing paddle. The tide was moving at 6 knots and even in benign conditions there was no landing for 25km. It sticks out into the North Channel which separates Scotland from Ireland. 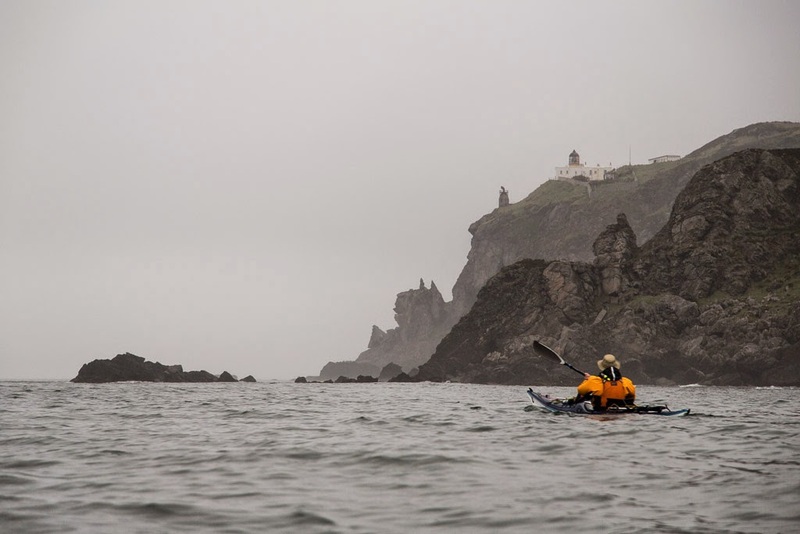 On this misty day there was no sign of Ireland and we felt like we were paddling round the edge of the World. mouth of the the Kyles of Bute. Murray's Isles lie in the mouth of Fleet Bay on the Solway Firth. In early summer they host noisy colonies of cormorants and gulls. 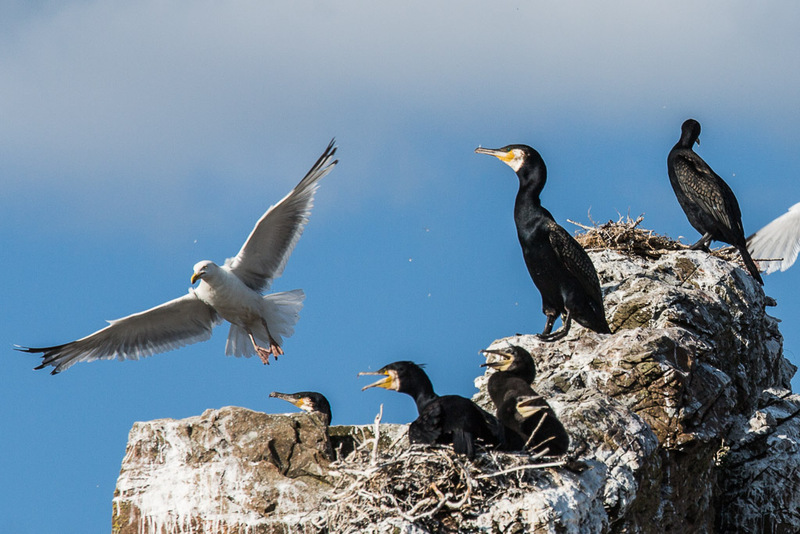 The cormorants need to keep a watchful eye on their eggs and chicks as the gulls swoop down on any unguarded nest. It is a wonderful experience to drift in the tide past the colonies in kakak and watch, hear and smell the constant activity. 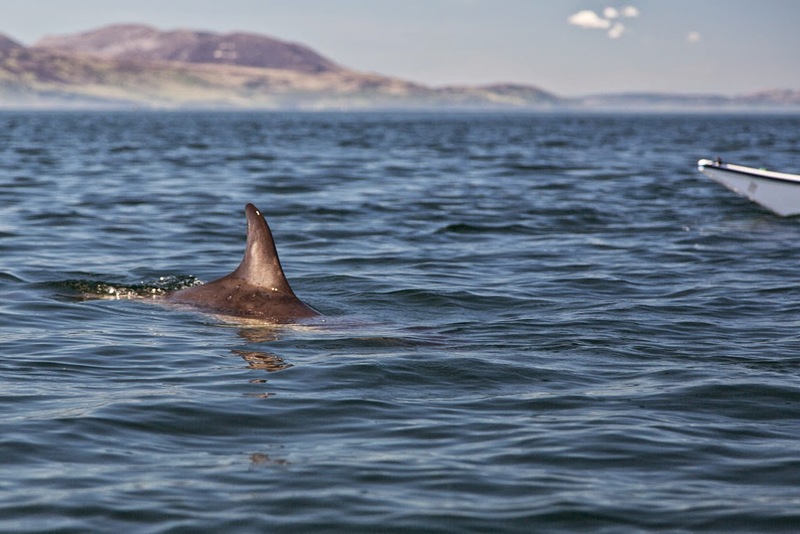 Nothing can be finer than paddling across the mouth of Loch Fyne on a summer evening. The surf beach at Machrihanish is exposed to the North Atlantic swell and extends for over 6 kilometers. 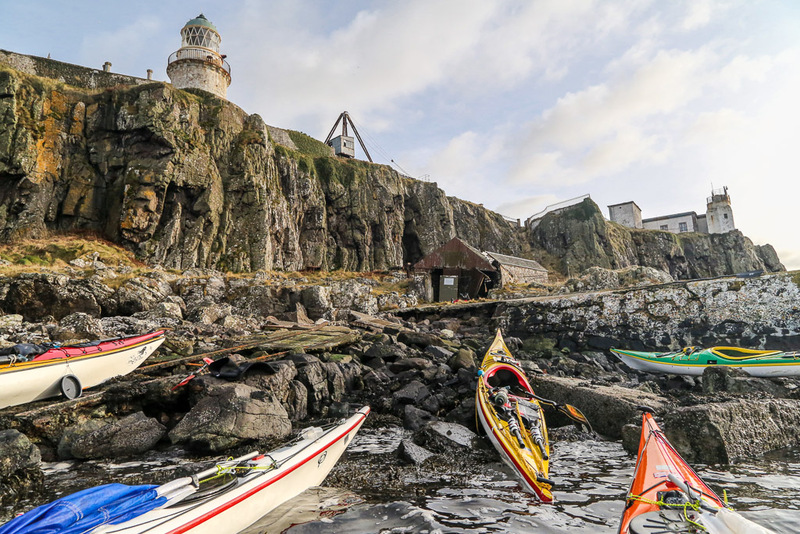 It is probably wise not to surf a fully laden sea kayak in amongst the surfers. The dune system behind the beach is one of the largest in Scotland. 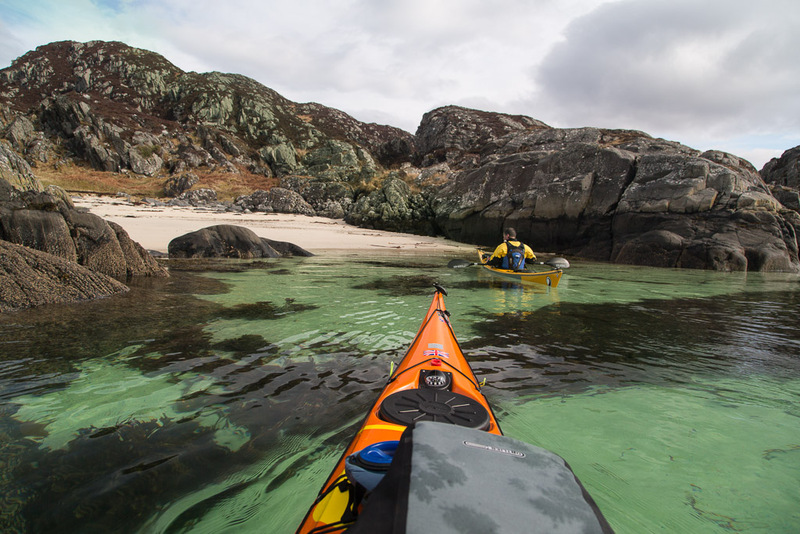 Shoe Bay is easily missed as it is hidden in the skerries at the mouth of Loch Moidart. The name comes from the very soft sand which swallows footwear! 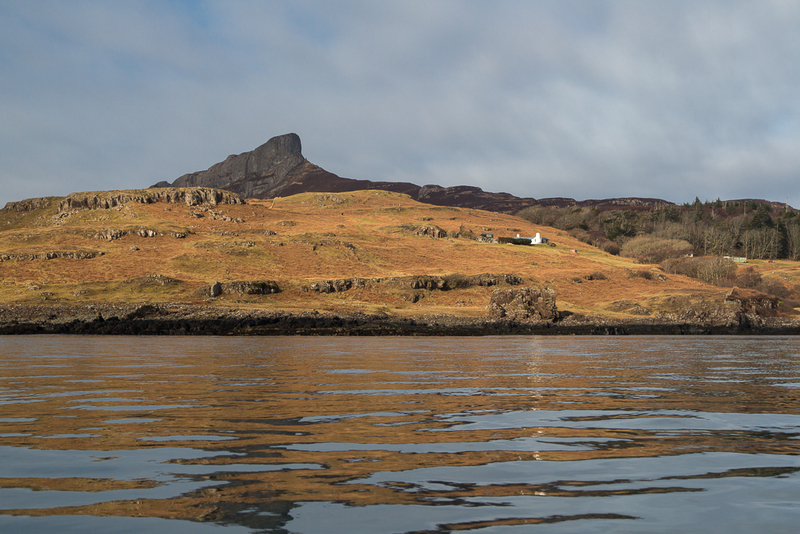 The dramatic outline of An Sgurr is the highest point of Eigg in the Sea of the Hebrides. 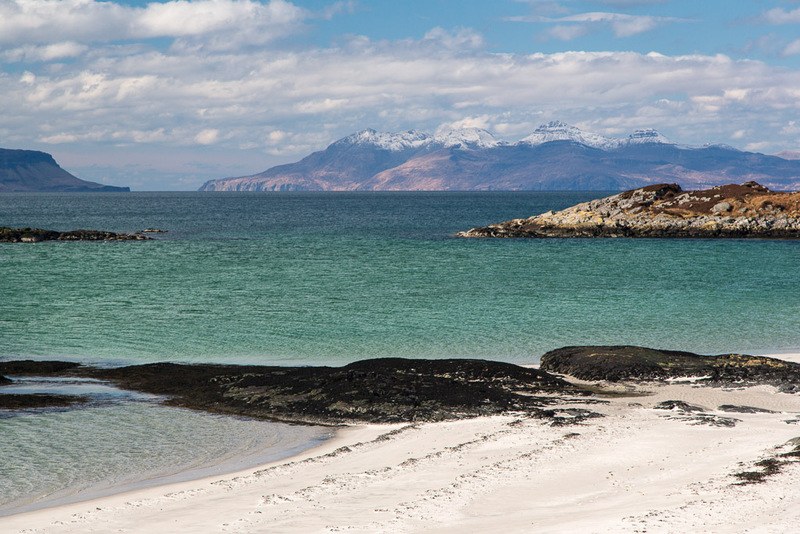 This is the view to the Small Isles from the silver sands of Morar Bay. The bay is shallow and tidal and in a westerly wind, steep breaking waves build up as the ebb tide rushes over sandbars. On this trip the wind was from the east and all was calm.